There is a classic novel written by Evelyn Waugh, called Brideshead Revisited. It takes place during the Second World War in England. The main character of the book is Charles Ryder, a self-proclaimed agnostic. He either doesn’t believe in God, or he believes that, if there is a God, we could never know Him anyway. Brideshead Revisited is about Charles’ encounter with a deeply Catholic family, but one that is even more deeply flawed. We soon discover there is a multitude of neuroses and much dysfunction in that family! At times, some of the characters are entrenched in gravely immoral behavior that brings them very far from God. Charles’ new friends will prompt him (and the reader) to question the authenticity and value of their Catholic faith. What, after all, is so great about a faith that seems to have little or no impact on the people that profess it? But, of course, Charles gradually discovers that the greatness of their Catholic faith is not found in any particular one of them, as much as it is found in the God who loves them. Brideshead Revisited is a story about God’s mercy, and how He consistently guides them and sustains them with grace and a deep sense of the virtue of hope. They’ve closed the chapel at Brideshead . . . mummy’s Requiem was the last Mass said there. After she was buried the priest came in . . . and blew out the lamp in the sanctuary and left the tabernacle open and empty, as though from now on it was always to be Good Friday. I suppose none of this makes any sense to you, Charles, poor agnostic. I stayed there till he was gone, and then, suddenly, there wasn’t any chapel there anymore, just an oddly decorated room. I can’t tell you what it felt like. 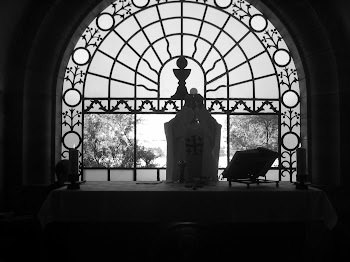 Few things are more desolate for a devout Catholic than an empty tabernacle. If you have ever been to the Mass of the Lord’s Supper on Holy Thursday, then you know the Blessed Sacrament is removed and the tabernacle is empty until the end of the Easter Vigil on Holy Saturday. It often takes the absence of someone we truly love to recognize how important they are in our lives. 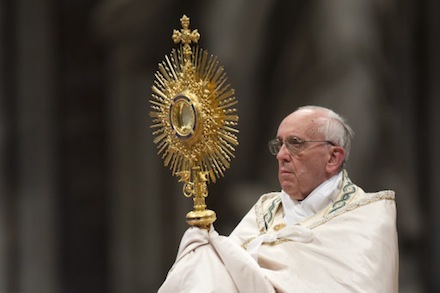 The real presence of Christ in the Eucharist is no exception. In the mid 1700s, a Franciscan priest in the Italian city of Siena went to the tabernacle one morning during Mass, only to find it completely empty. Someone had come in during the night and stolen the Blessed Sacrament! What they were really after was the golden ciborium, the container that held the Eucharist. Without understanding what they had done, they stole the Body of Christ along with it. The people were outraged. The Archbishop immediately organized public prayers of reparation and the entire city prayed for the return of the Blessed Sacrament. Two days later they found the consecrated hosts in a church halfway across the city. They had been dumped into a large poor box, which hadn’t seen much use over the years! When they finally retrieved them, the hosts were covered with filth, dust and cobwebs. Obviously they couldn’t consume them; they would have gotten sick. Instead, they cleaned them off as best they could and put them aside so that they would eventually deteriorate on their own. Only they never did. Some fifty years later, they still retained the same freshness. The archbishop ordered a scientific experiment to be done, and a commission declared that they were perfectly intact and showed no signs of deterioration. These same hosts are still there in that little church in Siena, just under 300 years later, as fresh as the day they were first consecrated. A crisp fragrance of newly baked bread is said to accompany the sacred particles. It is considered the world’s only continuing Eucharistic miracle. Receiving the body of Christ in the Blessed Sacrament of the Eucharist, embracing Him in faith and persevering in that Gift, we receive the power of God that sustains us for eternity. We do not merely receive our Lord and “reserve” Him within us for a decade, or for three hundred years. Christ, the Living Bread, will give us eternal life. What an amazing and awesome Gift we have in Christ! About ten years ago, in his Apostolic Exhortation, Sacramentum Caritatis, Pope Emeritus Benedict XVI was reflecting on his inauguration homily immediately after being elected pope. He had indicated, at that time, that nothing is more beautiful than to be surprised by God, to encounter Him in love, and then to share that friendship with those who do not yet know Him (see Sacramentum Caritatis, # 84). So many people in the world around us—people that we know and love—think that God is angry; or they think that God is absent; that He does not care about us, or is indifferent to our daily struggles and challenges. None of those things are true. Our friends in the world around us are starving for a real encounter with the living God of mercy! Has not this been the constant and consistent message of Pope Francis, from the initial days of his papacy? It is the constant call from God, that the Church should reach out to those well outside her borders, and enable others to encounter God. Traditionally, the Solemnity of Corpus Christi would fittingly conclude with a procession. The priest, carrying the Blessed Sacrament in a monstrance and elevating our Lord as he exits the Church, is followed by the entire congregation as they process through the streets of the local city or town. What an awesome witness for those in their homes or in places of business, to see that Jesus Christ and His Bride, the Church, are present in their midst. In a certain sense, every Mass concludes with a procession of this kind. In every celebration of the Eucharist, we are called to be surprised by joy, surprised by love, and to then bring that love, and the presence of God, to those who long to experience it. So many people in the world today experience what Cordelia describes in Brideshead Revisited, and what that Franciscan friar experienced in 1730 in Siena: that God is absent from their lives, that there is a void in their souls that simply cannot be filled in any other way. How are we being called to bring the presence of Christ to a world hungry and thirsty for God?